Do you consider yourself a savvy shopper? How about for the holidays, where the best deals are to be had? It’s almost impossible to keep track of them all but the Black Friday Specials List makes it simple and fun to do. All the deals you see, either in stores or online can be carefully documented on this free template and readily available for you at any time. If you’re ready to get down to business when it comes to saving for the holiday season, give this free template a try! The free template document has three main elements to it. The first helps you create a list of all the stores you know and love, then you can create an email to spread the love of savings to friends and family, finally, you will put all this information together on a single page. With the click of a button, you can send your loved ones all the information about a specific sale instantly. To learn more about this great template, just read the instructions given below. Begin in the “Lists” tab given to you below. Consider this a place to make future shopping easier and more efficient. Everything you enter here will be available in the “Black Friday” tab as a drop-down menu option. 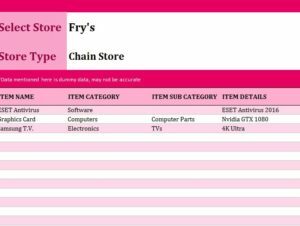 Once you have compiled a comprehensive list of stores and information, you can easily use this template year after year. Just enter the store names, store types, item categories, and subcategories in the corresponding columns. Now, if you’re someone that loves sharing deals with the people you know, you can write a general email in the “Email” tab. You will be able to send that message, along with the details of any Black Friday sale, in the “Black Friday” column later on. You are then free to use the main “Black Friday” tab to enter the sales you see on social media, television, online, etc. Most of the section in this template will allow you to use your convenient drop-down items you entered in the first step of this tutorial. List the item, item category, subcategory, details, link, price, sale price, and the template will show you how much you save by automatically calculating the difference. Since each row represents a different sale, you can add a person’s email address in column L to send them the details of the sale. Once you click the “send email” button, your message you wrote earlier will be sent to them, along with the information you listed in the specific row of the “Black Friday” tab.